David Escobedo is a fascinating character with a deep connection to his own heritage in the construction industry. Join Kristof as he interviews David for a conversation that outlines not just the path of a builder, but the path of someone who wants to leave behind a legacy. David Escobedo is the active founder of Escobedo Group where he leads a six-division, vertically-integrated luxury home building company that self-performs their work. Escobedo’s focus on solid construction methods, resulting in superior aesthetic beauty, is seamlessly delivered due to the fact that the company is literally building every aspect of the project within their own stone, metal and millwork divisions. Equipped with the latest CNC technology and some of the best craftsmen in the country, Escobedo guarantees razor-edge precision, which has become the signature of his work. Today, David’s primary focus is utilizing digital fabrication and computational modeling within all the company’s divisions, leveraging his DARIO panelized construction process that delivers fully systems-integrated pre-fabricated wall, floor and roof panels that mitigate the customary high-end residential construction issues surrounding weather, labor force scarcity and site risks. Escobedo is literally revolutionizing how luxury homes are built with his DARIO process. Escobedo is known within the design and building industry for his technical design capabilities, his skills in fabricating complex and challenging structures and his problem- solving techniques. 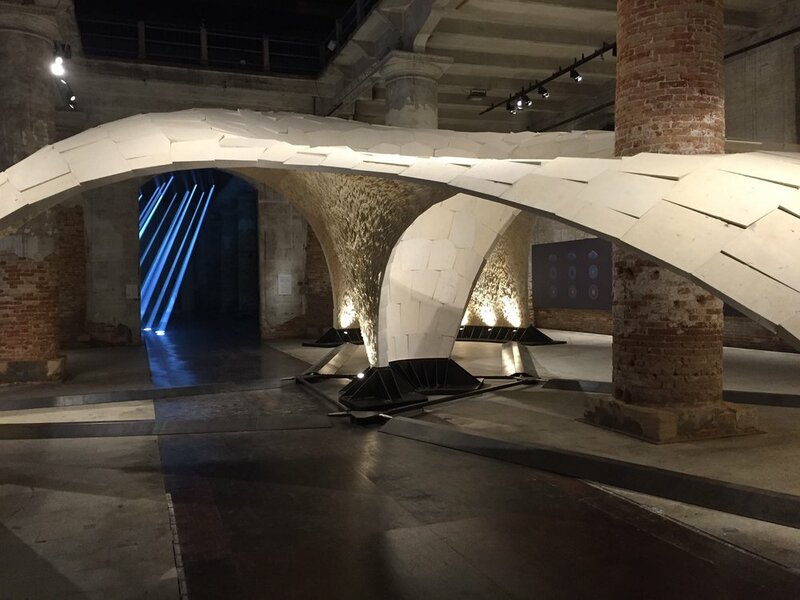 In 2016, Escobedo collaborated with colleagues from MIT, ETH-Zurich and Cambridge to design and fabricate the prestigious Armadillo Vault, a 399-piece limestone vault with a 60’x50’ footprint standing in true compression; a showstopper at the by- invitation-only 2016 La Biennale di Venezia Architettura (prototype model pictured above). Escobedo and his work have appeared in Dezeen, CNN Style, Domus, The Economist, BBC with Will Gompertz, Austin Business Journal, Houston Chronicle, HGTV, The Guardian, Architectural Record, Inhabitat, Architect, Elle Decor, Detail, Luxe, Western Interiors, Cowboys & Indians, Objektandothers. The company was deemed the #1 General Contractor in Texas in 2018 and has won the Artisan award from Texas Society of Architects, as well as the Custom Home Pacesetter Award. David Escobedo had been named one of the top 100 most influential Latin business owners in America. David lives just outside Austin,Texas with his wife Kathy, three dogs and a cat. All three of David and Kathy’s children (Matt, Jessica and Anna) work at Escobedo Group.